If you have not visited Nikko, you are missing one of the best tourist spot in Japan. 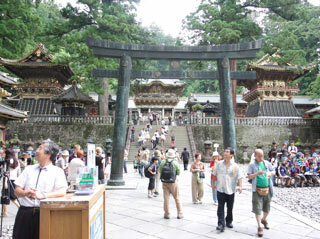 Nikko is located approximately 3 hours from Tokyo, and it has the best shrines and temple in Japan. MLJ will introduce the easy tour to visit all spots that you must not miss. They are registered as World Heritage Site, and most of the buildings are also registered as National Treasure of Japan. Start at Nikko Station. Use local bus to visit Shinkyo(Nikkobashi). Shinkyo is the sacred bridge. It is one of the symbol of Nikko and the official entrance of Nikko zone. Then walk to Nikko Toshogu. Nikko Toshogu is the most beautiful shrine with the most gorgeous buildings in Japan. It the mausoleum of Tokugawa Ieyasu, the 1st Tokugawa Shogun. Yomeimon Gate is one of the best construction in Japan. After finished Nikko Toshogu, visit Futarasan Shrine. Futarasan Shrine is the oldest shrine in Nikko. Toshogu is the shrine with many excellent and beautiful buildings. Futarasan Shrine is the shrine with harmony of nature and history. It is very quiet. It's not the shrine to see, but it's the shrine to feel nature and history. Then, visit Taiyuin Temple is another gorgeous spots. It is a mausoleum of Iemistsu, grandson of Ieyasu. Taiyuin is all less scale and beautiful than Toshogu. Therefore, the color scheme is very simple and based on black and gold. However, this turns out very rich architecture and arts. After you enjoy three gorgeous shrines and temples, walk to Shiraito Falls. Nikko is originally surrounded with a beutiful nature. Shiraito Falls is not a huge waterfalls, but very beautiful waterfalls. Shiraito Falls is located in the entrance of Takio Shrine. Takio Shrine is a beautiful shrine of nature. It belong to Futarasan shrine. Futarasan shrine is the harmony of history and nature. Takio has also the beautiful nature. Then, walk back to Nikko Station. It will be a great one day trip around Tokyo. Nikko has the best that Japan can offer. Nikko Station→(10min. )→Shinkyo→(10 min. )→Nikko Toshogu (1 hour)→(5 min. )→Futarasan Shrine(30 min. )→(5 min. )→Taiyuin(45 min. )→(45 min. )→Shiraito Falls(10 min. )→(10 min. )→Takio Shrine(30 min. )→Shinkyo(1 hour)→(use bus. Walking 30min. )→Nikko Station. Nikko Toshogu Shrine (日光東照宮) is a Shinto shrine in Nikko, Tochigi Prefecture. It is part of the "Shrines and Temples of Nikko," a UNESCO World Heritage Site. Toshogu is dedicated to and enshrines Tokugawa Ieyasu ( 徳川家康), the founder of the Tokugawa Government and the first Tokugawa Shogun. After his death, his son the second Shogun Hidetada, and his grandson the third Shogun Iemitsu built this shrine in 1617. Most of the shrine and it ’s structures are preserved in their original form and many of them are designated as National Treasures of Japan. Admission fee:1,300 yen for adult, 450 yen for kids. For Treasure Museum: 500 yen for adult, 300 yen for high school, 200 for kids. For Art Museum: 800 yen for adult, 600 yen for high school, 400 yen for kids. 1. use Local bus to Nikko Toshogu 15 min.